It would not be wrong to say that Jenneau 64 is a great example of contemporary and elegant design. Some of the main features are its incredible speed, stability and the interior volume. The deck has perfect amount of space for relaxation and the interior has all custom choices available when it comes to fabrics, leather and wood. All in all, it is a great family cruiser. Aside from the awesome regular features, this particular boat was commissioned with the most awesome speakers on the mast! We did a master mattress and bedding throughout for this beautiful Jenneau 64. 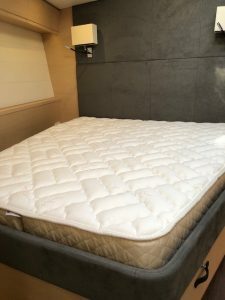 For this client, we did our most popular 7” Latex mattress. It is constructed with a 6″ Latex core and covered in an ultra-soft bamboo quilting. We specialize in Latex. The benefits of a latex mattress include being mold and mildew resistant, extremely comfortable, latex helps regulate body heat, which allows you to sleep cooler and it is bendable and breathable. We make everything custom. 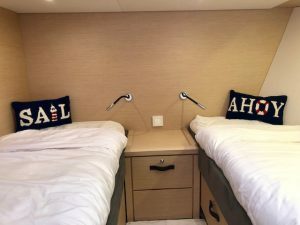 Each boat mattress is crafted to fit the unique size and shape of your berth. Each boat mattress we make is crafted custom in California and built to stand up to rigors of a marine environment. For bedding, we used our Sferra Grand Hotel collection. This ever-popular percale is embroidered with tailored double-rows of satin stitch with many colors to choose from. This style duvet cover is best suited for square to rectangle beds to show off the beautiful embroidery as you can see in the image here. You can browse our website to view our entire Sferra Collection. If you are a percale lover, then Sferra is definitely for you. From Sferra Analisa, to Sferra Celeste, we have something for everyone. Also, check out our Sferra Celine Throws. We used couple of them for this client here. The Celine throw blends soft color with cream in a herringbone weave, and finishes it with a twisted natural fringe. 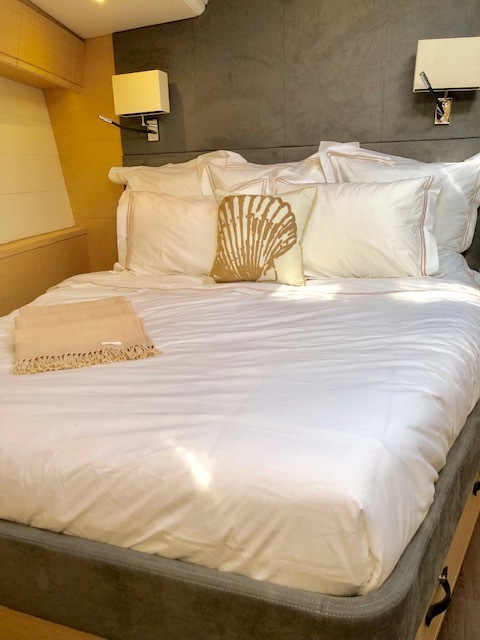 The designer has kept the whole theme simple, clean and elegant with white sheets and duvets in our finest linens and yet this compliment the interior as well as the exterior of this wonderful sail boat. Feel free to email us if you are looking around for some new linens, mattress or topper for your yacht. 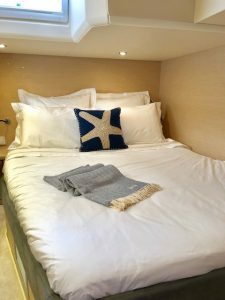 Yachtbedding.com can be your one stop for all your bedding needs.